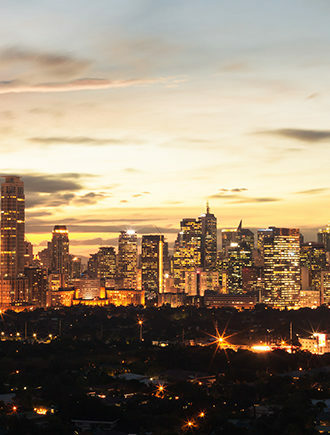 Located north of the central business district, Poblacion is the historic center of Makati City along the Pasig River. Its red-light strip along P Burgos Street has earned a seedy reputation for the neighborhood. Recent years, however, have seen a wave of hole-in-the-wall hostels, cafés and restobars draw in a cool and cosmopolitan crowd, who have nicknamed the area “Williamsburgos” — a portmanteau of the neon-lit drag and Brooklyn’s hipster haven. Makeup artist and Makati native Xeng Zulueta takes us to her top haunts tucked away around this buzz-worthy enclave. Head to the rooftop bar of Z Hostel (5660 Don Pedro St; +63 2 856 0851) for sundowners and panoramic views of the neighborhood lit up against shiny skyscrapers. It’s the perfect spot to mix and mingle. “I don’t know anyone who leaves this place without an NFF (newfound friend),” says Xeng. A pioneer of Poblacion’s recent gentrification, this flashpacker favorite was formerly a brothel. Before you go: how about a spin on the lobby’s stripper pole? Another ideal late afternoon spot is The Social on Ebro (5770 Ebro St; +63 917 727 0072), a mini food park fashioned from container vans. Colorful murals, buntings and lanterns lend a festive atmosphere. Enjoy rounds of their best-selling Pimm’s Cup — a classic British summertime drink — with Costa’s brick-oven pizzas or Kashmir’s Indian and Middle Eastern plates. If you’re craving some bulgogi or samgyupsal, look no further! With its sizeable community of Korean expats and students, Poblacion is also Metro Manila’s Koreatown. Top Dish (4890 Durban St; +63 2 758 1122) is a mainstay serving legit Korean food. “I’ve celebrated my last six birthdays here over my favorite plate of nakji-bokkeum (stir-fried octopus),” says Xeng. Right above Bucky’s is another chill-out corner: Alamat Filipino Pub & Deli (2/F 5666 Don Pedro St; +63 917 530 2580). “Most order local craft beer, but I come here for their Pinoy cocktails,” says Xeng while sipping on a spiked version of sago’t gulaman (tapioca and jelly drink). “I’m a rebel that way.” For unique bar chow, sample artisanal sausages inspired by classic Filipino dishes like sisig (sizzling pork jowl), bopis (minced pork lungs) and dinuguan (pork blood stew). Xeng: Is OTO super new? David: We’ve been around since January 2017. David: We serve up specialty coffee by day and craft cocktails by night. And, this always surprises people, we serve really good food — some people come just for the chocolate cookie. Xeng: So what’s the best time to drop by? David: If you like it really busy, turn up on a Friday or a Saturday 10pm onwards. Makati Junction Hostel offers free WiFi and private parking, and access to an on-site bar. Lokal Hostel offers essential amenities and easy access to local nightlife. MNL Boutique Hostel offers shared bathrooms in each room, as well as kitchen facilities.